I see our favorite color and black! I am seriously begging and pleading to have all of these treasures! I would literally DIE just die if all of this was sitting in Adie's closet. Stinking cute as ever!!! I guess that's why it's on our wish list! (for now; right???) I cannot get over how cute little girls clothes are. Makes me want to be little again; well that and being so carefree would be perfect right about now! I have two wishes for me this time! I found these OMG must haves and now it's gonna be like Confessions of a Shopaholic and whisper and nag at me, BUY ME BUY ME! Way cute and I already love them! Kate Spade I want these two amazing pieces, xoxo Lisa. 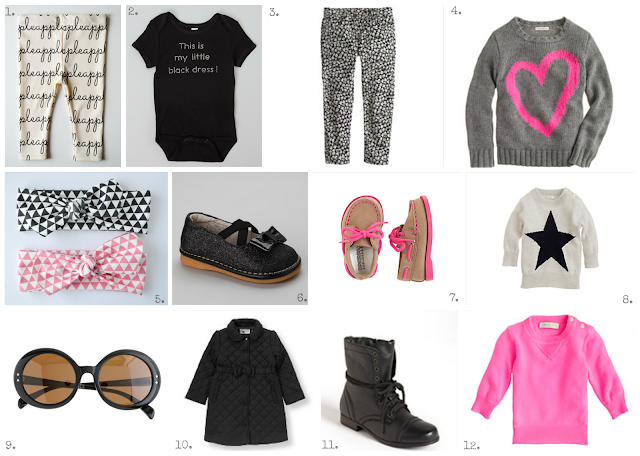 Thanks for seeing what's on our wish list today! Happy Monday and Happy Shopping! Go out there and get something on your wish list! There is always more just around the "corner"!